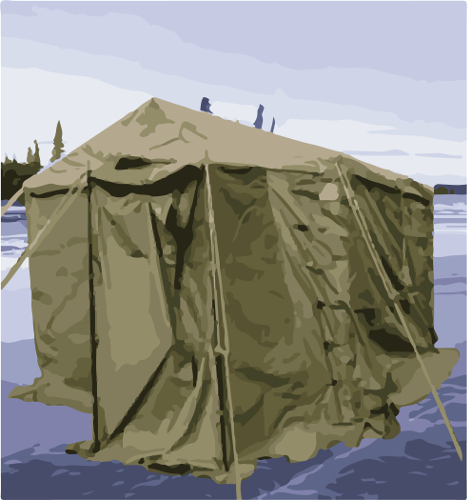 Even though summer is upon us and it is way too late to take advantage of this idea for this fishing year at least, here is something to keep in the back of your mind for when the snow flies again later this year: how about using your military surplus tent for going ice fishing? Some of my fondest memories of grandad were gotten while sitting on the ice of his farm pond, fishing through a hole and sitting in an old wooden guard shack he had gotten from the Ford Motor Company after he had retired from a local factory after thirty years. We had a Coleman heater and Grandad brought coffee and Brunschwieger sandwiches with thick slices of raw onion and mayonnaise. Though I won't eat that now, in my youth I recall this as being high living, but I might have just enjoyed spending time with my Grandpa. The shed was kept, during the summer, in a corner of the cow-barn on a wooden sled so that we could easily pull it out onto the ice once the weather turned cold enough. Here are three reasons to use a military surplus tent to go ice fishing with like I used to with Grandpa Everett. 1. It is ultra portable. Me and Grandpa used to have to pull the shed out onto the ice with the little Ford 8n tractor, and I can remember that he would make me stand on the bank and watch to make sure the ice was thick enough to support the weight of the tractor. With a military surplus tent, that precaution is unnecessary. 2. It will offer you great protection from the environment. You would even be able to build a fire in your tent, a luxury that we didn't have in the tiny guard-shack that grandpa had. 3. It is failsafe. If Grandad's shack would have tumbled into the drink, that would have been the end of that. The old seasoned wood would have sunk straight to the bottom and been gone forever, with your tent, if it gets wet it's no worries... just haul it out, dry it, and re-pitch it at your leisure.